Is the Flames' Ugly Start a Cause for Concern? Home/NHL West/Calgary Flames/Is the Flames’ Ugly Start a Cause for Concern? After five games and a 1-4-0 record to start the 2015-2016 NHL season, fans of the Flames can begin hovering their hands over the panic button. Of course you cannot clinch a playoff spot in October but in the NHL’s Western Conference you can certainly lose one. The Flames uninspired play has them sitting last in the Western Conference and winless on home ice. With an exceptionally tough Central Division coupled with the upstart San Jose Sharks, Vancouver Canucks, Arizona Coyotes, and the soon-to-turn-the-corner Anaheim Ducks and Los Angeles Kings falling too far behind is not an option for the Flames. Yes, it is still early and those teams succeeding now will all go through slumps and of course the Flames could rattle off a stretch of inspiring hockey that gets them back in the race; however, the problem is the Flames have showed minimal signs of playing like the inspired hockey team of last season. The words “we were outworked tonight” have already been uttered by coaches and players more times in the first five games of this season than last season–not to mention after stinging losses in the season opener against the Canucks and this past Saturday night against the arch-rival Edmonton Oilers. To further show how bad the Flames start has been look at where the team ranks in key statistical categories: 24th in average goals for (currently averaging two goals a game), 27th in shots per game (outshot in every game except their one win), 20th in penalty kill, 13th in power play efficiency, and 28th in faceoff winning percentages. The age old adage states that when quality teams are playing poorly they can rely on their goaltending to win them a game or get them out of a funk. Unfortunately for the Flames, the goaltending has also been poor. The team has the third highest goals against average and Jonas Hiller and Karri Ramo rank 48th and 49th respectively out of 50 goaltenders who have started at least one game this season. Essentially, everything that I discussed in the season preview has gone poorly for the Flames. The good news is the team can only go up from up here. The season turnaround has to begin with Hiller and Ramo–once again, they do not have to be stellar they just cannot lose the team games. Hiller and Ramo can be aided by the offence finding its touch–two goals a game and limited shots on goal will not win many games in the NHL. 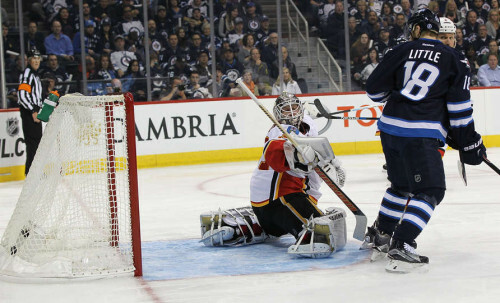 Additionally, the Flames seem to have established the startling habit of giving early or late period goals which have either zapped momentum or ended any chance of a comeback. This is a sharp contrast from last season when the Flames were the ones scoring the momentum shifting goals–especially late in the third period. As noted in the beginning of the article, fans’ hands should be hovering over the panic button, the button should not have been hit just yet. Last season showed that the talent and means is to turn this season around definitely exists in the Flames’ locker room. If anything, the Flames success last year buys them a little more time in my book. Let us re-evaluate after the ten game mark.